Gift cards are such a convenient holiday gift idea, but let’s be honest: they can seem a bit impersonal. 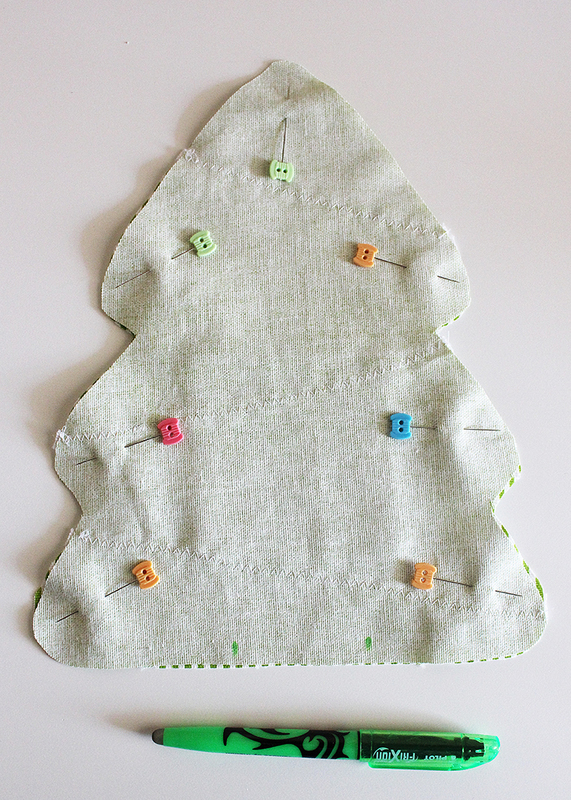 Stitching up a fabric Christmas tree gift card holder will solve that problem, lickety split! 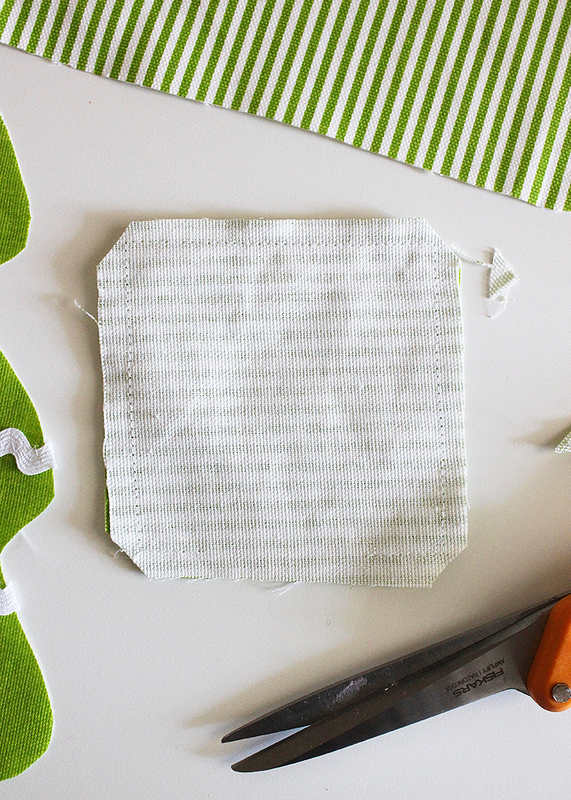 This simple tutorial is so easy to make (even for beginners), and you can use scraps of fabric from your stash for the job. These would make fun stocking stuffers or gifts for anyone on your list to present a gift card in adorable holiday style! 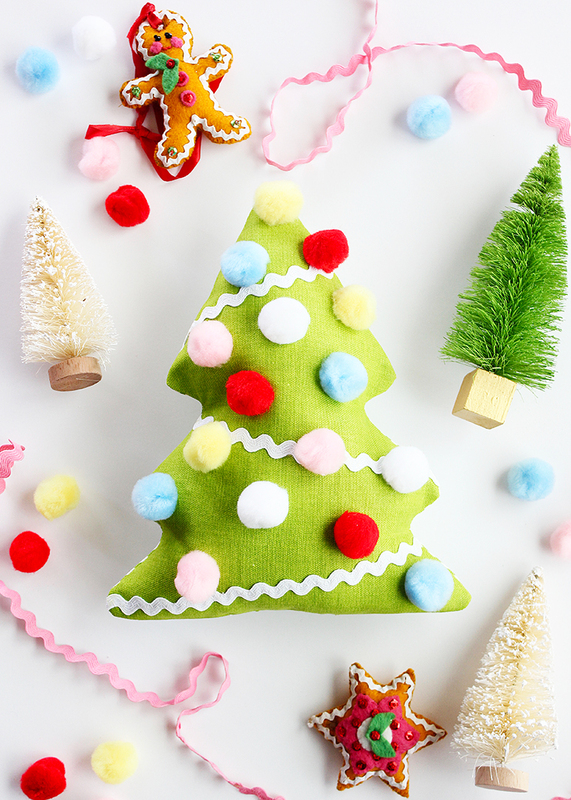 Continue reading for the full tutorial, including the free PDF pattern pieces to make this fabric Christmas tree with a handy gift card pocket. Download and print the pattern pieces. Note: Both the main body and pocket pieces will print on the same page, so you will need to print two copies of the pattern. Be sure to select borderless printing and print the pattern at 100%. Cut out 2 main body tree-shaped pieces (for the tree front and back), and 2 pocket pieces (for the pocket outside and lining). 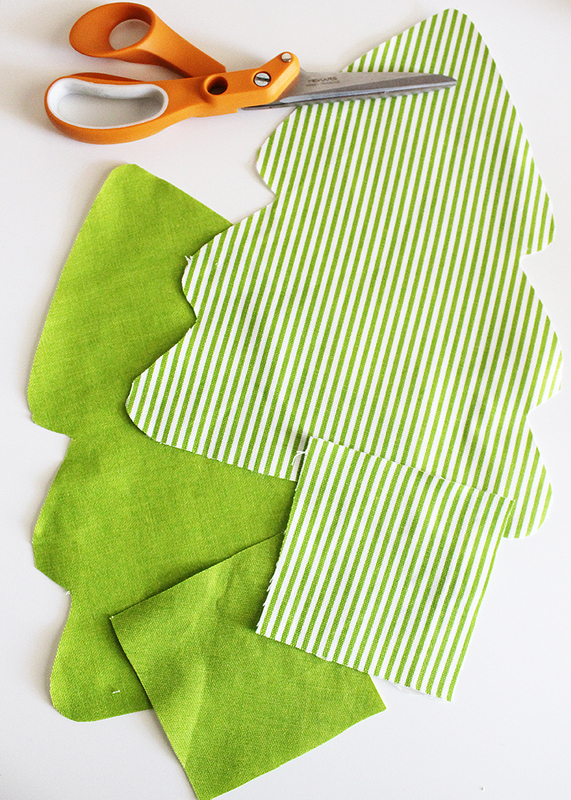 I chose a solid fabric for the front side of my tree and a striped for the back. Arrange the rick rack trim on the front tree piece at a diagonal, as shown. 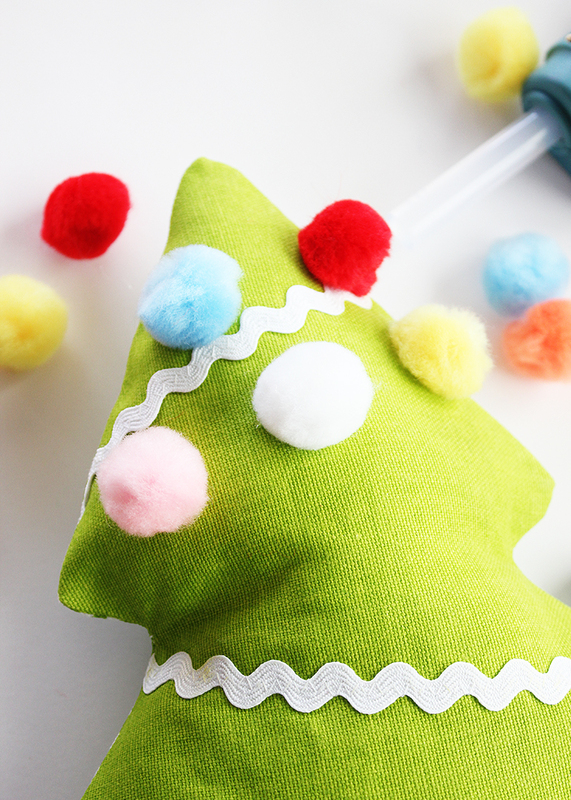 Pin the trim into place, and affix it to the tree front with a zig-zag stitch. Set this piece aside. Place the outer and lining pocket pieces together, right sides facing. Pin. 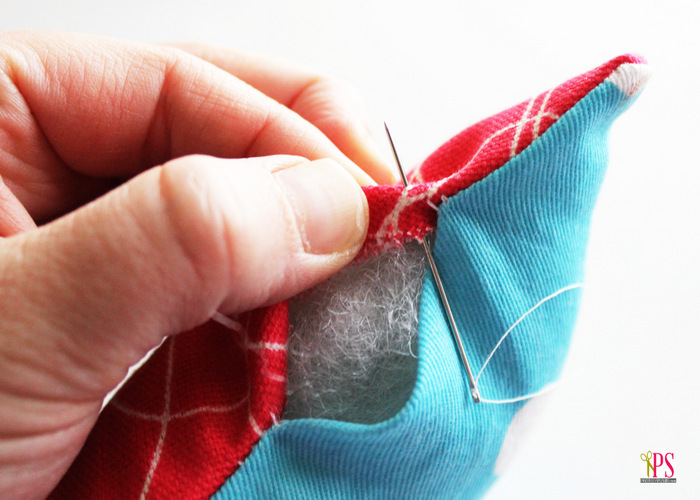 Stitch around the perimeter of the pinned pieces using a 1/4″ seam allowance, leaving a 1.5″ opening at the center of the bottom edge. Clip the corners, as shown. Turn the pocket right-side out through the opening and press flat. Center the pocket piece on top of the tree back piece so that the unstitched edge runs along the bottom. The lower edge of the pocket should be 1.75″ away from the lower edge of the tree piece. Pin into place. 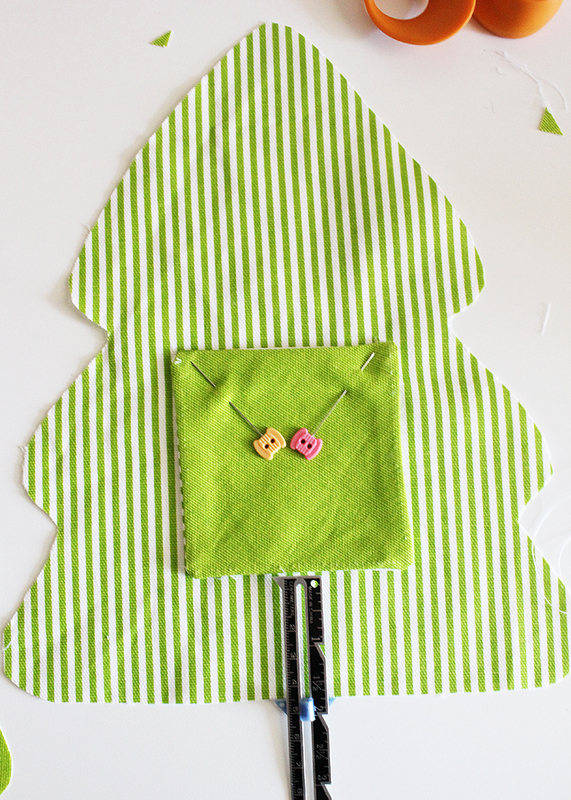 Affix the pocket to the back tree piece by stitching 1/8″ away from the edge of the right, bottom and left edges of the pocket piece, closing the opening along the lower pocket edge as you stitch. Stack the front and back tree pieces on top of one another, right sides facing, so all of the outer edges are aligned. Pin. If desired, use a fabric marking pen to create two marks that are about 2.5″ apart along the lower edge to indicate where your stitching should begin and end. 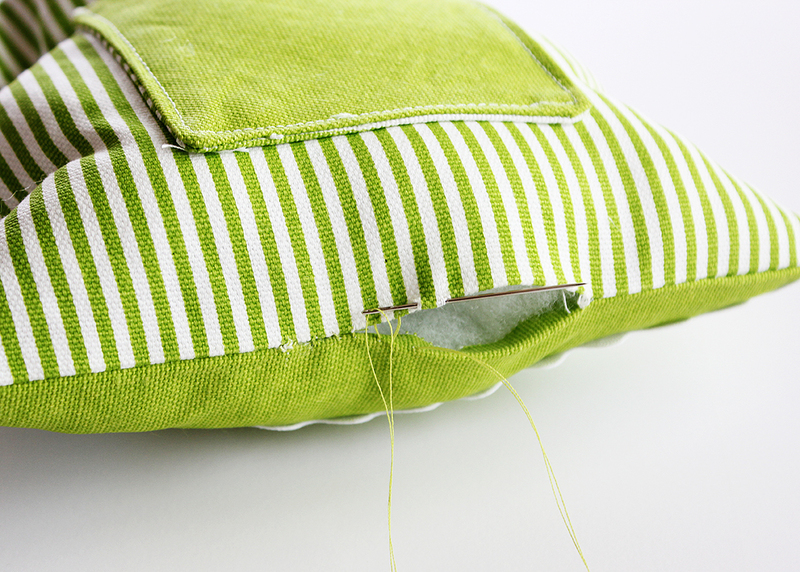 Use a 1/4″ seam allowance to stitch around the perimeter of the pinned pieces, leaving the space between the marks you made open. Turn the piece right-side out through the opening, using the point turning tool to thoroughly turn the points and edges; press. Stuff the tree with fiber fill, using the same point turning tool to push the batting into the points of the tree. Hand stitch the opening closed. 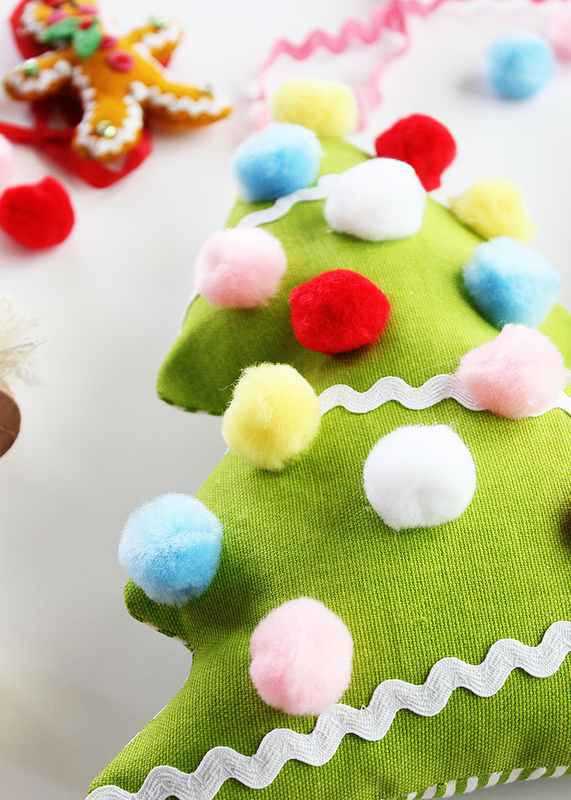 Finish your tree by adding pom pom ornaments to the front side with hot glue. 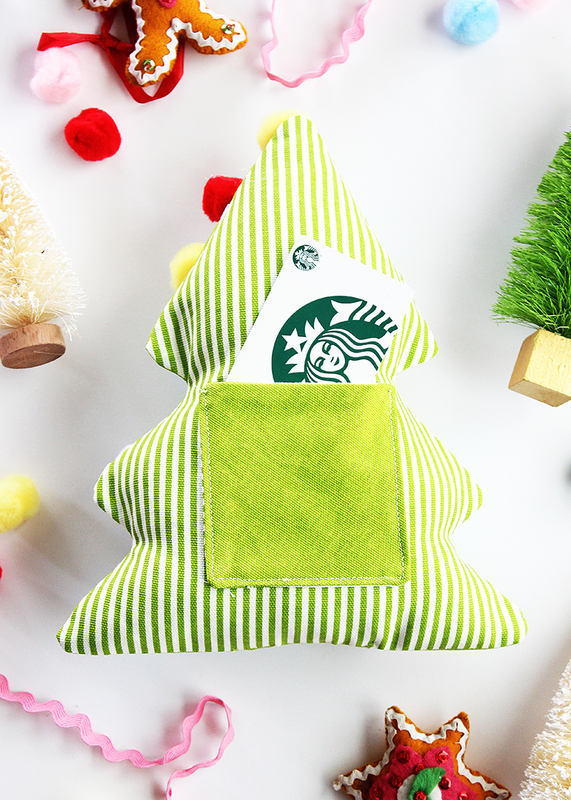 …with a handy pocket on the back for giving a gift card to someone special! The pom poms and rick rack give this project such a fun, vintage vibe. I just love it! 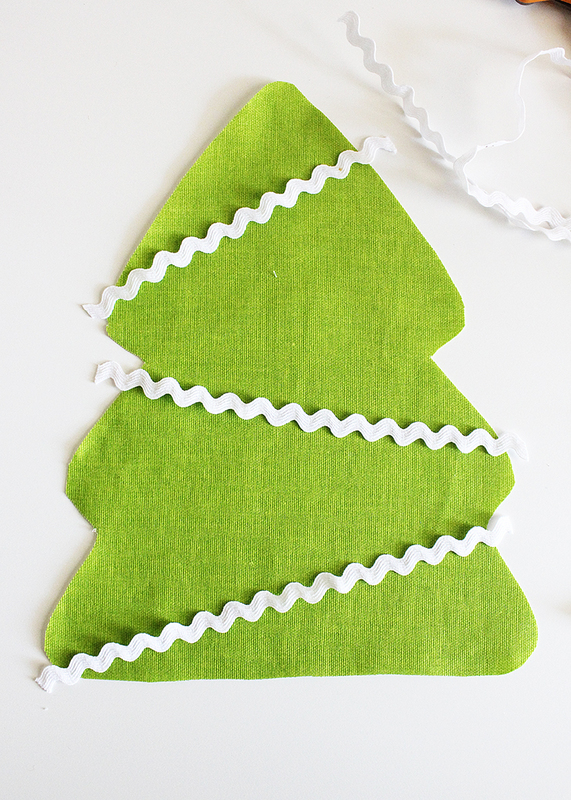 Need help stitching the opening of your tree shut? 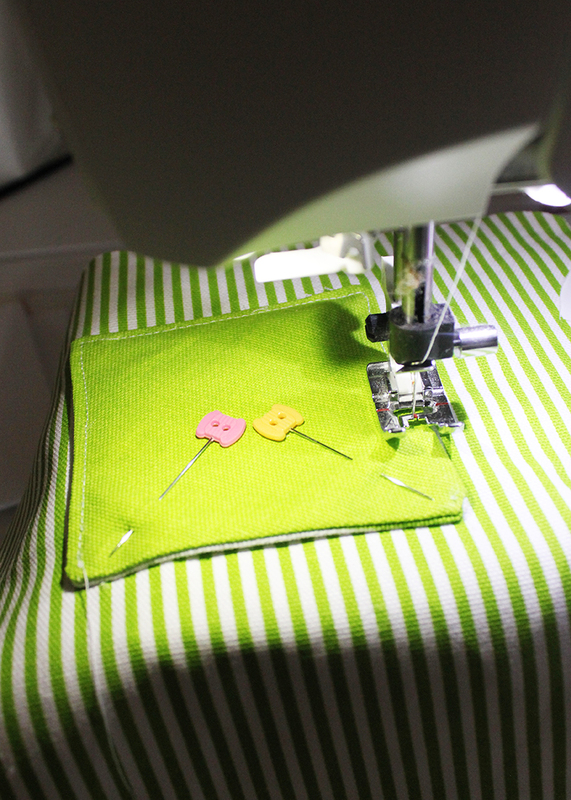 Check out my step-by-step photo guide for how to stitch openings closed by hand! 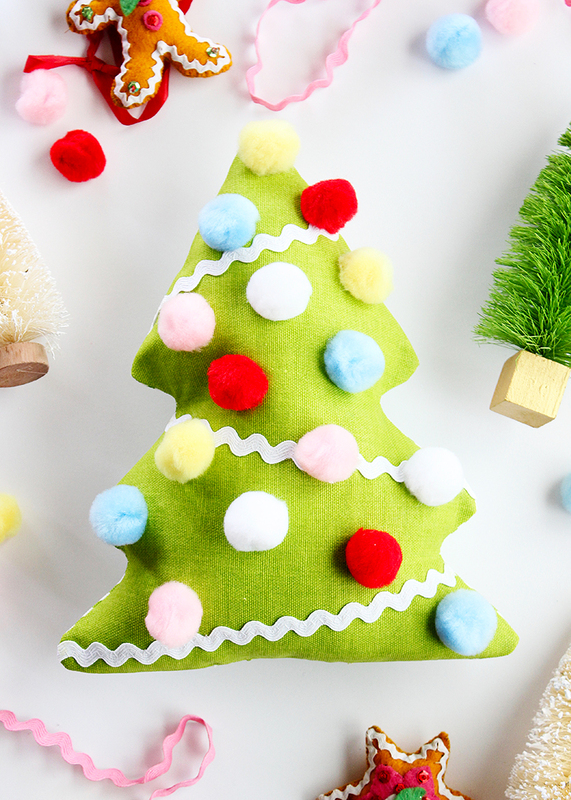 Looking for even more fun Christmas sewing projects to try? Don’t miss these other great ideas!